Atlanta, GA: As often occurs during the Month of May, events, and graduation parties keep people and the city of Atlanta quite busy. On such a day, on May 18, 2014, besides scores of graduation events, one of the most popular Hindi film singer, Sonu Nigam was performing in Midtown Atlanta. The obvious is expected: delays, confusion, and lower turn up of audience. 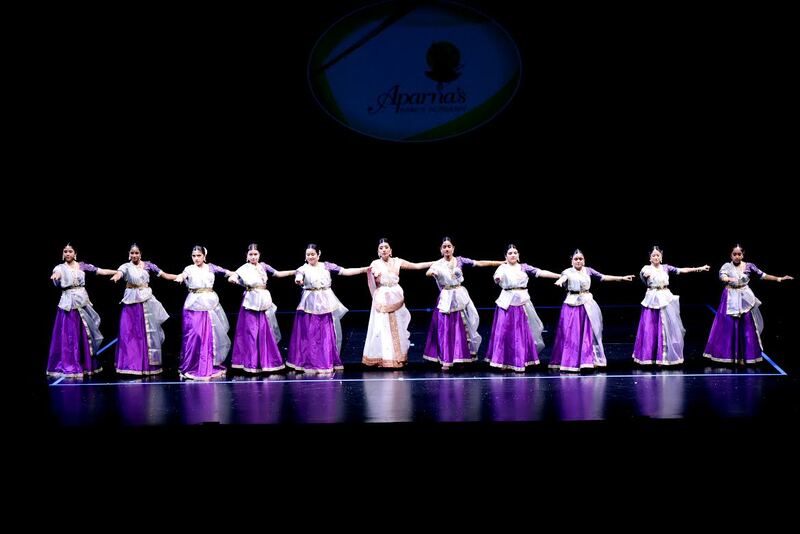 Well, none of that happened at Aparna’s Dance Academy’s 8th annual show, Kathak Utsav, at Alliance Theater. The audience packed the waiting area well before the show started, and when the doors opened, not a single seat remained unoccupied in the theater. Some of the comments from the audience after the show sums it all, “As usual it was an awesome evening filled with outstanding performances, seamless co-ordination and complete dedication.” It seems that regulars of Kathak Utsav have started expecting a flawless event every year. 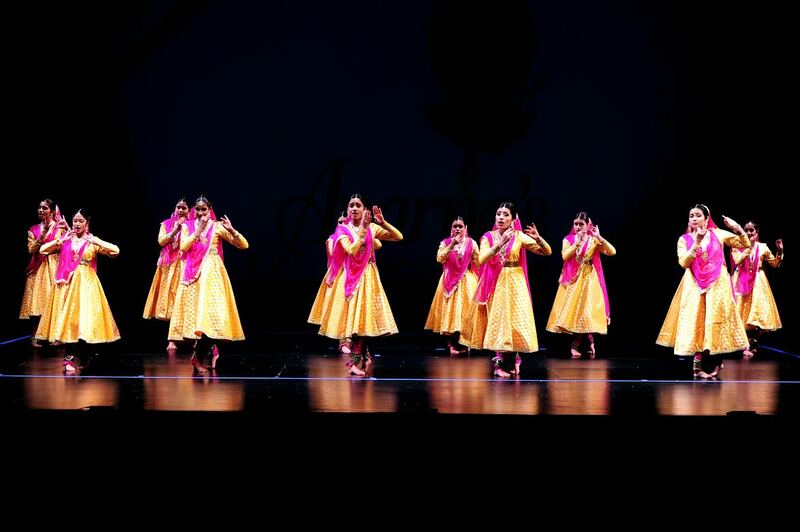 Like the preceding seven years, Aparna’s Dance Academy students performed a large variety of Kathak dance items. A group of students of Aparna’sDanceAcademy, started the show with Shiv Vandana, on a very soulful and deep voice of Pt. Jasraj. The Kathak choreography therefore, was also fittingly rich in content, including Shiva poses; first displaying serenity and then emotions of aggression with high speed and energy. This performance shows the hard work of the young performers, who have learned and practiced for months to perform on the stage. In the next students’ performance, Aparna’s senior students performed Kathak on the classical kathak theme, Radha & Krishna’s love story. The music was taken from the song “Mai Radha teri…”, from the popular Hindi film, Vishwaroopam. This performance demonstrated “Nritya” component of Kathak, which is story telling, with the use of expressions. Next came the master herself, Aparna Sharma. She performed at the beginning, in the middle, and towards the end of the show, and coordinated back stage with students for their performances. While exhibiting boundless energy, Aparna Sharma shows that she knows her craft. Through her performances, Aparna provided an example of the beauty of Kathak, and what students can look forward to become as performer themselves. Aparna performed taal, teen taal, which included chala, thaat, ganesh paran, kavit, thodas, parans, gatt nikas, gat bhav, and jaipur style fast chakkars. This is the pure and traditional form of Kathak. The music is composed by Aparna herself. In her final performance, Aparna performed Thumri, on a composition of Pt. Birju Maharaj. Aparna choreographed the dance in her own Jaipur Gharana style. 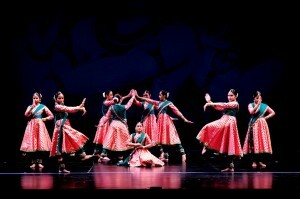 Story telling is the root of Kathak, and Kathakar or Kathak dancers tell stories through their dance. Kathak has evolved from its early days, but story telling is still an essential part of this dance form. Kathakar tell stories in detail, play multiple roles, and most often do not use any props. They use their expression to display every small detail of the story. 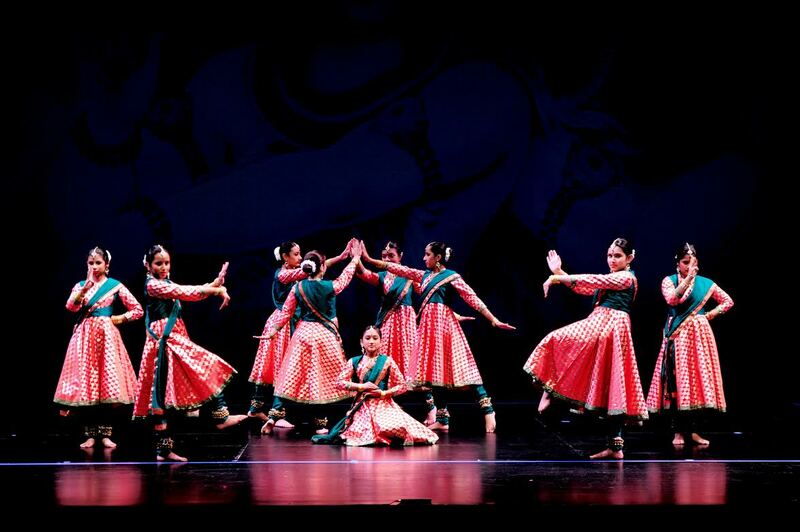 This type of performance requires many years of work in learning and practicing Kathak. Thumri is that difficult part of Kathak. In this Thumri, Aparna performed the roles of Radha, Krishna, Gopi, Gopika, telling the story of Holi played in Vrindavan. Audience could read the story in her expressions, when Aparna was enacting Krishna mischievously throwing colors on Radha, Radha getting upset; Radha doing Sringar (make-up); Krishna mixing Holi color and ensuring it is strong; and so on. It is amazing to see that a short dance performance could be so rich in story. Only the ancient and a rich art like Kathak could provide a way to express it so beautifully. Aparna proved the rich heritage she earned from her guru, Guru Rajender Gangani, and perfected it with decades of learning and practice. A number of Kathak performances by junior students, and some senior students demonstrated their progress over the years with Aparna’s Dance academy. 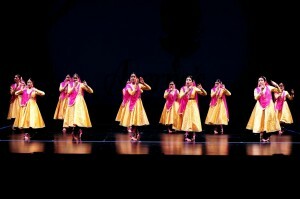 Students performed on a variety of Tarana ( Kathak dance), rich Rajasthani folk dances, and selected Hindi film dances. A number of compositions were home grown, by Aparna Sharma herself. Some of the performances had the audience clap alongside the beats of the performers. The host of the evening, Kamal Mohanty, did an outstanding job of describing the meaning of each dance, and its emotion.